The Gold Shares ETF continues to stabilize around my quarterly pivot at $113.60 while GLD nears a weekly chart buy signal. The Commodities ETF has been above its "reversion to the mean" since the week of Aug. 24 after tracking it lower since the week of May 4 in a bottoming. The Long Dollar ETF has been downgraded to negative based upon its weekly chart, but weakness has held its "reversion to the mean". Here are the weekly charts for the gold, commodities and dollar exchange-traded funds. The gold trust ETF tracks the spot price of gold and is said to be backed by gold bars in vaults in London. The Gold ETF ($113.49 on Sept. 21) is down 8.2% year to date, and its weekly chart remains negative but oversold with the ETF below its five-week modified moving average at $114.40 and below its 200-week simple moving average or "reversion to the mean" at $117.67. This average was last tested during the week of July 13 when it was $117.76. 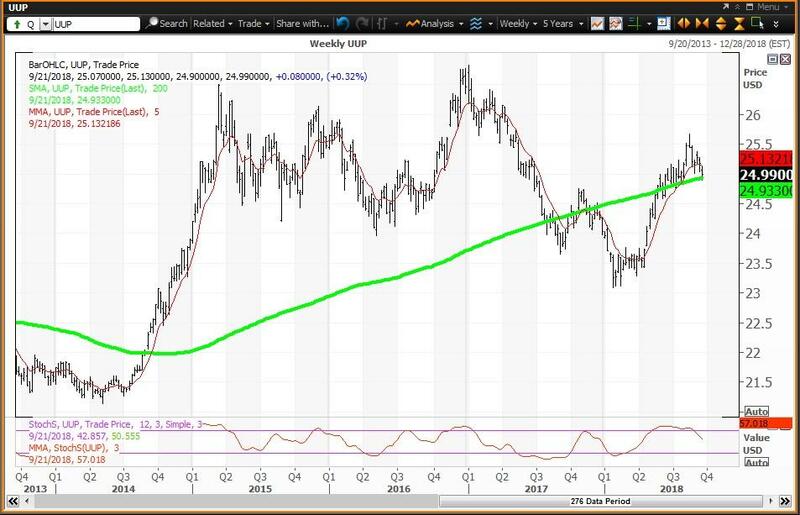 The 12x3x3 weekly slow stochastic reading ended last week at 18.94, up from 16.69 on Sept. 14 with both levels below the oversold threshold of 20.00. 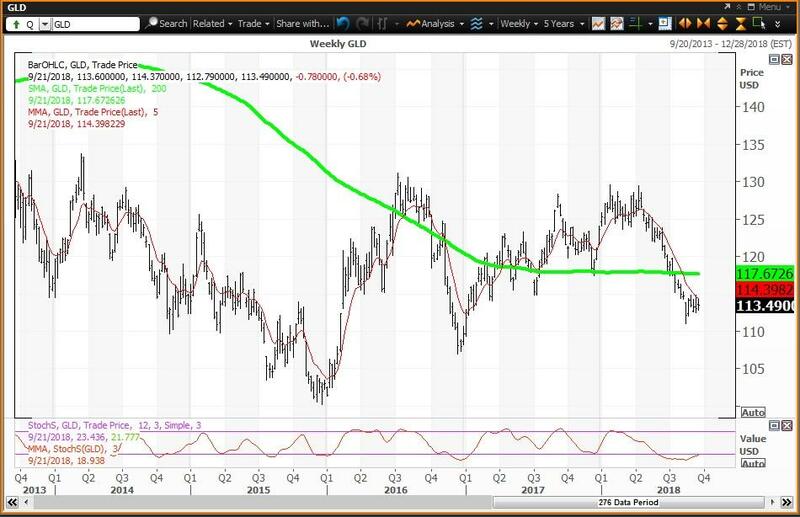 A close this week above $114.40 will pull the stochastic reading above 20.00, shifting the weekly chart to positive. Investor Strategy: Buy weakness to my weekly and semiannual value levels of $111.21 and $103.62, respectively, and reduce holdings on strength to my monthly risky level of $118.08. My quarterly pivot remains at $113.60. The commodity ETF is heavily weighted to energy by about 60%. 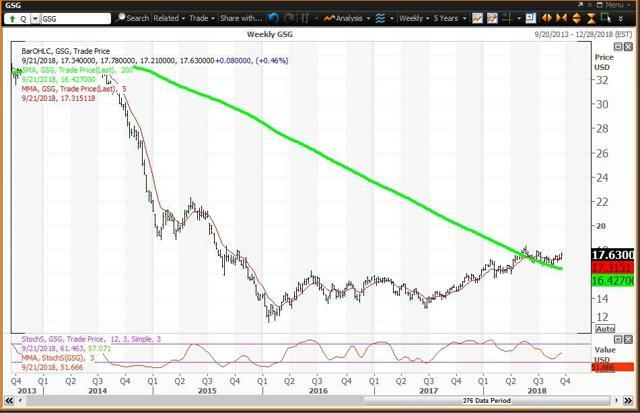 The Commodities ETF ($17.63 on Sept. 21) is up 8.3% year to date with a positive weekly chart with the ETF above its five-week modified moving average of $17.32 and above its 200-week simple moving average or "reversion to the mean" at $16.43. The 12x3x3 weekly slow stochastic reading rose to 51.67 last week, up from 46.77 on Sept. 14. Investor Strategy: Buy GSG on weakness to my quarterly and annual pivots of $16.25 and $16.20, respectively, and reduce holdings on strength to my monthly risky level of $18.16. The US Dollar ETF is a basket of currencies that includes the dollar vs. Euro, Japanese Yen, British Pound, Canadian Dollar, Swedish Krona and Swiss Franc. The Dollar ETF ($24.99 on Sept. 21) is up 4% year to date and has a negative weekly chart with the ETF below its five-week modified moving average of $25.13, but weakness has held its 200-week simple moving average or "reversion to the mean" of $24.93. This ETF had been climbing this average since the week of May 25 when the average was $24.72. The 12x3x3 weekly slow stochastic reading slipped to 57.02 last week, down from 64.10 on Sept. 14. Investor Strategy: Buy weakness to my quarterly and annual value levels of $24.84 and $24.18, respectively, and reduce holdings on strength to my semiannual risky level of $28.65.